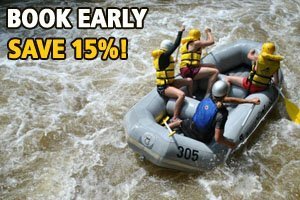 Most of the visitors to Ohiopyle may think that summer is the best time to visit, ride the Great Allegheny Passage, or do some whitewater rafting on the Youghiogheny River. But we have a little secret we just have to share with you. Fall is a WONDERFUL time to visit! After the big holiday weekend, Ohiopyle becomes a sleepy little town with few visitors but lots to see and do. The weather stays nice through September with temperatures averaging around 70 degrees. And then there is the beautiful fall foliage which starts in September and peaks in the beginning of October. Whitewater rafting in the fall is a special experience, especially during the week. Trip sizes are often much smaller than during the summer, making for a more personalized trip format. And with all the rain we experienced this summer, water levels are forecasted to be excellent. We have wetsuits available for rent at check-in if the temperatures happen to be chilly. And don’t forget to hit the trail for some great biking. Spend the day on a ride up to Confluence for lunch and take in all the colors the Youghiogheny River Gorge has to offer! As an added incentive to consider a visit to Ohiopyle this fall we are running our Fill ‘er Up Special! Fill a raft with 5 friends or family members and you raft free. That’s 5 paying rafters with one freebie. OR reserve a trip for 4 people and get 10% off! This offer is only good for the Lower or Middle Yough guide escorted tours. Mention code FUB to take advantage of this great special. Book online now or call one of our adventure specialist for assistance with your reservation at 1-800-472-3846. Please enter code in the Coupon Code field on your online reservation. Some restrictions may apply and this special is only good for new reservations. All photos courtesy of Ohiopyle Adventure Photography. ← Fun Field Trips in Ohiopyle!